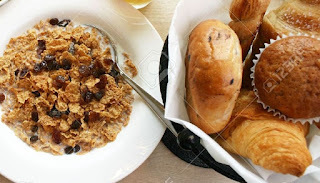 Fit Fluential Mom: What You Should NOT Eat for Breakfast & Why! I’m sure you’ve had those days where you wake up and scarf down something that’s convenient so you can get out the door as fast as possible. Now it should go without saying that starting your day with foods like doughnuts, pastries, or pancakes is a fat storing NIGHTMARE. But many turn to other so-called healthier alternatives that are nearly just as bad. Most store-bought muffins are giant, which means they can sometimes contain over 600-700 calories that have absolutely NO protein or healthy fats to keep you feeling full and satisfied. Would you sit down and knowingly eat FOUR slices of bread? Well, MOST bagels have the equivalent of four servings of bread, which will quickly convert into sugar making you store fat and feel lethargic in no time. Over-the-counter cereals are, by far, one of the worst foods for your waistline and your health. The majority of over-the-counter cereals are empty calories, simple carbs and sugar, cleverly disguised as a “healthy” breakfast. There are a few rare exceptions, like some of the cereals in the Ezekiel 4:9® line from Food for Life®, but I NEVER eat cereal when I’m trying to get leaner. If you wake up and eat ANY of the above 3 foods to start your day, you'll feel like you ate a cup of salt! Instead, opt for lean protein and complex carbs. A good example would be egg whites or 1-2 eggs paired with whole oats, fresh fruit, yogurt or cottage cheese. All foods you can still eat on the go and won't sabotage your day. My go to every single morning is Shakeology. Has the protein I need, tons of fruits and veggies, only natural forms of sugar in low amounts and I have have it while driving or dropping off the kids at school!